Newlyweds in the thrill of togetherness forget that financial bonding is as important as forming physical and emotional attachments in life and the success of marital life, to a large extent depends on the savings, investment and spending habits of the partners. A solid financial base goes a long way in promoting marital harmony. What’s life without a goal? Sit together and write down all the future financial goals that you both agree on. Then plan your savings in three tiers-an emergency fund, a short term savings fund and a long term savings corpus that includes retirement. Looking at the recession hit economy it is ideal if you accumulate an emergency fund covering twelve months expenses, or three months at the very least. This will be earmarked for medical emergencies, and other big ticket expenses. Buying a home is top priority for many newlyweds, and a mortgage helps you in many ways. If you want to take maximum advantage of the Federal Housing Administration (FHA) loans, then making a down payment aggregating 20% of the costs will spare you the need for paying the monthly premium on an FHA guarantee or the premium on private property insurance. Split the 20% down payment year wise to arrive at your savings goal. The younger we are the more we can set aside for retirement. If, for example you were to start retirement planning at 30 years and deposit $1,000 annually into your IRA account and the savings attracts interest at 7% per annum, by 65 years you would get approximately $1,50,000. By starting earlier at the age of 20 years with the same level of savings you would be adding $20,000 extra to your retirement kitty. That’s the power of starting younger and earlier. If you are both very clear on your financial goals you can mutually decide how much you need to save every month. 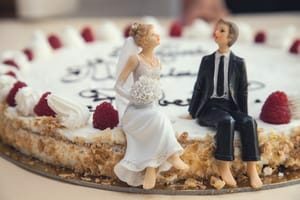 If both the partners are working and earning, set aside savings from one partner’s income for health care and insurance and let the senior partner shoulder the retirement planning responsibility. You need not embrace high technology accounting software if you can follow the golden rule of personal savings which is that roughly 50% of your income should cater to your essential needs, 30% should be earmarked to fulfill your wants, and the balance 20% should be allocated for savings. If you observe that your savings efforts are lagging behind at any stage it will be time to create some form of additional income or to cut your expenses drastically to stay on track. Unless you meticulously track all expenses you will not know where income is leaking. To start with cut the cost of daily fast food and coffee intake to the extent of just $10. That small cost cutting will save you more than $3,000 annually, enough to boost all the three savings categories. Once you have mobilized enough savings you can park the money in minimal interest rate savings accounts, higher interest CDs and high earning money market accounts so that you have sufficient liquidity (easy access to cash) for tackling the short term and medium term goals like purchasing a car or buying a home. An emergency fund takes time building, and what if the economic crisis or personal problems don’t give you time to save quickly? The best way of kick starting an emergency fund or to meet emergency cash payments head on, is through a loan for vehicle title. The car equity loan allows you to carve out 60% of the commercial value of our idle car, money that would be immensely useful to you. The car title becomes the collateral for the auto collateral loan, with the interest rate below 25% APR, which is quite reasonable compared to the triple digit interest credit cards. The fast car title loan is easy to avail, and just as easy to repay with borrowers getting to choose amortized installment payments stretching over a longer duration.